I’ve never been a huge fan of Shrimp Scampi. 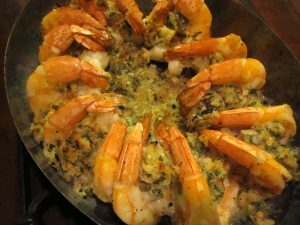 I love the garlic but the butter seems overwhelming and traditional scampi can be a little flat in flavor. This recipe from the Barefoot Contessa makes up for all of the lackluster. You can prepare the butter & herbs early: just don’t add the panko until you are ready top bake. The original recipe calls for 12 tablespoons of butter. I cut it down to 8 but by all means knock yourself out and butter up. The lemon is the star of the show. The aromas will keep you parked in front of the oven door… watching… waiting. Serve with a side of whole wheat linguine or eat it out of the pan. This makes a great appetizer or entree. Peel, devein, and butterfly the shrimp, leaving the tails on. Place the shrimp in a mixing bowl and toss gently with the olive oil, wine, 2 teaspoons salt, and 1 teaspoon pepper. Allow to sit at room temperature while you make the butter and garlic mixture. In a small bowl, mash the softened butter with the garlic, shallots, parsley, rosemary, red pepper flakes, lemon zest, lemon juice, egg yolk, panko, 1/2 teaspoon salt, and 1/4 teaspoon of pepper until combined. Starting from the outer edge of a 14-inch oval gratin dish, arrange the shrimp in a single layer cut side down with the tails curling up and towards the center of the dish. Pour the remaining marinade over the shrimp. Spread the butter mixture evenly over the shrimp. Bake for 10 to 12 minutes until hot and bubbly. If you like the top browned, place under a broiler for 1 minute. Serve with lemon wedges. I heart butter….hopefully the whole wheat linguine will cancel out the fat? Your presentation is amazing.